This dish is a firm favourite of mine as it displays the yin and yang principle I use when making a curry. Sweet, aromatic spices balance the harsher, strong spices. Mix together the flour and 2 tsp garam masala with some salt and pepper in a dish. Dredge the chicken in this mixture, shaking off any excess. Heat 1 tbsp oil and half the butter in a large frying pan and fry the chicken, in batches if necessary, for 2 minutes on each side. Remove from the pan and set aside. Heat the remaining oil and butter in a saucepan and sauté the onions over a gentle heat for 5 minutes, until soft. Add the cumin seeds, fennel seeds and bay leaves and cook for 1–2 minutes. Add the tomatoes, garlic, turmeric and remaining garam masala and cook for around 10 minutes until the mixture becomes thick. Add the chilli and chicken and simmer for 15 minutes until everything is cooked through. 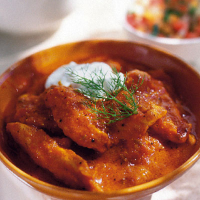 Serve with yogurt and fennel fronds or coriander leaves. Yogurt, tomato and curry spices are best with a cool gently flavoured beer.